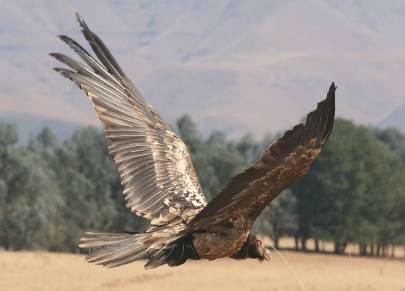 In August 2009 a Bearded Vulture was captured by Ezemvelo KZN Wildlife staff in the Underberg area and fitted with a tracking device as part of the ongoing Maluti Drakensberg Vulture Project lead by Ecologist Sonja Krüger. The project aims to obtain more information on the movement patterns of Bearded Vultures in southern Africa and the causes of mortality in order to address the threats to the species. The species is classified as endangered and population numbers are continuing to decline. The young Bearded Vulture was named Olivia in honour of Olivia Taylor, a scholar from Durban who has assisted the project greatly with her fund raising efforts. Since 2009, Olivia has covered a large area and provided some interesting information on her movements (see map). Two years later, at the end of March 2012, the team noticed that Olivia has been stationary for too long, which meant that she was either dead or her tracking device had come off. 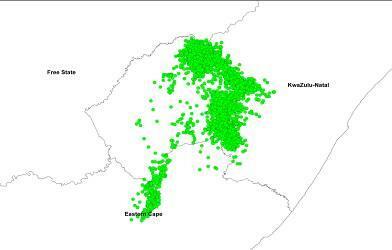 The team made plans to find her at her last position in Ts’ehlanyane Nature Reserve in Lesotho. In early April two staff members from Ezemvelo KZN Wildlife travelled to Maliba Lodge where staff from the lodge guided them through difficult and steep terrain to the top of the mountains where Olivia’s tracking device was transmitting from. Although they got close to the site, the team had to turn around as some local herders on top of the mountain posed a security threat. After the first unsuccessful attempt, Maliba Lodge kindly put together a team of guides who went up the mountains in search of Olivia again the following week. Without a GPS to guide them to her exact location, they were unfortunately unsuccessful in finding her. 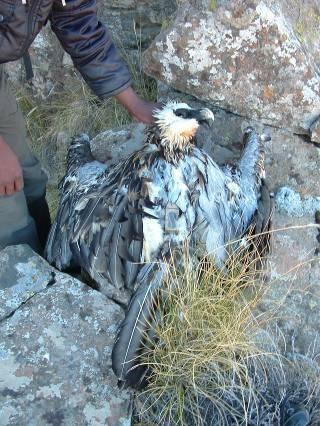 Olivia’s carcass (still with tracking device attached) amongst the rock in the Lesotho mountains. In future the team will need to react much quicker to retrieve the carcasses so that the cause of death can be conclusive. To date, three Breaded Vultures fitted with tracking devices have died from poisoning and one died after colliding with a powerline. A Biodiversity Management Plan has been prepared for the species and much need to be done to mitigate the threats facing these birds!! Vulture project and Camera Trap! Can anyone tell me what is happening to the Vulture Restaurants both at Golden Gate National Park and at Sterkfontein dam? I have passed these locations recently and at both places I saw no carcasses for the vultures. Is the road works (or lack of) on the Oliviershoek pass one of the factors stopping the KZN farmers from delivering their carcasses? If these restaurants are no longer used then we are causing a further problem for these magnificent birds.